Regular readers of this blog might have noticed that during the last few months I have posted a bit less frequently than at any time during the last fifteen years. There’s good reason for that: I was in business school and doing an accelerated online MBA program. Starting November 3, 2014, I was studying 6-15 hours/day, 7 days/week, until completion of the Master of Business Administration degree. Happily, then, on March 18, 2015 or 4.5 months later, I finished the MBA—13.5 months ahead of a typical two-year schedule. It was such an intense, enriching experience that I wanted to share it. In this post, I explain the how and why and hope to inspire others in furthering their own educational journeys. You may be wondering: why do an MBA in the first place? Every person has their different motivations, but as someone who is self-employed and already achieved financial independence, I had three primary reasons. First, I wanted to enhance my business and leadership skills. The former would come in handy in my engineering consulting practice, and the latter is useful for the various leadership and board of director roles I currently take on with local organizations such as this one. In an MBA program, I would develop my skillset for organizing business activity, managing business processes, and solving business problems. Second, I had a case of epistemophilia, or a love of learning. When I was a kid, I would check out half a dozen books and magazines from the library each week. This habit spilled over into adulthood, albeit in digitized, paperless form. A structured degree program seemed like a more comprehensive way to delve deeper into a genre I was really interested in than Wikipedia articles or self-help books. Third, I sought something that explains why I do ultra-endurance sports: challenge! A graduate degree is already challenging in itself—which may be one reason why only one out of ten Americans have done so. I figured, doing it in under five months would add to the stimulation of the experience, much like trying to run 26.2 miles in a Boston-qualifying time does. Challenge, incidentally, is a reason the great Dr. O’Neal, a.k.a. the Big Aristotle, cited in doing his graduate degrees, which included not only an online MBA but a doctorate in education. I can only hope to one day be half the Renaissance Man that Shaq the basketball player, rapper, actor, television analyst, businessman, reserve police officer, mixed martial artist, and real estate investor already is. This is a good question. With the inflation-outpacing costs of formal education, many people are asking just that. A friend even recently showed me a magazine article that argued that it would take decades of working with an increased salary to pay off both graduate school tuition and two years’ opportunity cost of not working. Indeed, Tim Ferriss, a Princeton alumnus and author of a trilogy of best selling, highly recommended life-hacking books such as The 4-Hour Work Week and The 4-Hour Body, decided that getting an MBA was not worth it. He once had dreamed of getting an MBA from Stanford University’s Graduate School of Business (GSB), but after sitting in on a class that was “taught by Ph.D. theoreticians who used big words and lots of PowerPoint slides,” he decided it would be a waste of his time and money. Instead of spending $120,000 over two years for a Stanford MBA, he concluded, it would be better to spend that amount of dollars over two years on angel investing on 6-12 companies with $10-20,000 chunks as his own real-life “business school.” (Note: it now costs over $160,000 for a Stanford MBA.) Fair enough—especially since he ended up doing brilliantly with his investments in companies such as Twitter, Uber, and Evernote. But an issue with both the magazine article and Tim Ferriss’ premises is that they assume the following: that an MBA requires years of study, and that it is too expensive. Or that an MBA is only worth its weight if you get it from a prestigious university such as Stanford. If those assumptions held true, then the answer to whether an MBA is worth the trouble may very well be no for all but the highest-paid executives. But consider: what if you could do a legitimate MBA in much less than two years for a few thousand dollars? Then would it be worth paying a school money to lay a solid foundation of business skills and knowledge at the very outset instead of learning as you go by trial and error? For me, the answer to that question was a resounding yes. Of course, it depends on how you define “legitimate.” In my case, I decided that “fully accredited” was perfectly adequate and I did not need an MBA from a super-selective school such as Harvard or Stanford, especially since I do not aspire to be the CEO of a Fortune 500 multi-national corporation where having a more prestigious degree could be helpful. Besides, I already have one degree from Stanford (in mechanical engineering). I did not need another one. If you have not heard of the little jewel of Salt Lake City, Utah that is Western Governors University (WGU), I would not blame you. Neither did I. I only knew of it because of my friend Tim. Not Tim Ferriss, but Tim Vail. Tim is one of a kind, a person you would be lucky to meet once in your lifetime. I was fortunate to live next door to him. He and I would do everything together: run, swim, bike, and attend Spanish and French conversation meetings. He could do the latter because he was proficient in ten languages. Yes, ten. He even learned to speak and write Korean and created an English-teaching website that is mostly in Korean. I miss him dearly. Anyhow, a few years ago while he was still living 50 feet away, he was essentially locked up in his house and I hardly saw him. I would invite him to come to Spanish, French or track, but he kept declining, politely saying words to the effect of, “Sorry, I’m really busy.” Turns out he was just extremely focused… doing an accelerated online MBA program. A couple years later, I was ready to apply. Of course, I researched other options as well. Like Tim, I decided that WGU would be the best fit. First, some history about Western Governors University. In 1997, 19 governors of U.S. states officially founded WGU as a means of providing affordable, competency-based education using 21st century tools. While seed money was provided by government sources, the university was established as a self-supporting private, non-profit institution. Within 13 years the Salt Lake City-based university was so successful that offshoots were created in other states, including WGU Indiana, WGU Texas, and WGU Washington, with $4.5 million of funding provided by the Bill & Melinda Gates Foundation in 2011. Two more offshoots, WGU Tennessee and WGU Missouri, were founded in 2013. These offshoots are basically in name only with all education provided by the Utah branch, but serve as a good marketing boost and allow for local graduation ceremonies. State education grants, such as in Indiana, can also be used to pay for tuition. Western Governors University has garnered numerous accolades in recent years, which is great for those who care about rankings. In 2013, WGU was ranked #1 in GuidetoOnlineSchools.com’s Top Online Colleges. In 2014, US News & World Report ranked WGU #1 for secondary teacher education among both online and traditional universities. WGU also earned the 21st Century Award for Best Practices in Distance Learning from the United States Distance Learning Association for several years running. One thing that blew me away was Fast Company’s 50 Most Innovative Companies of 2013 issue. WGU was ranked the 28th most innovative company, 20 spots ahead of my technology favorite, Microsoft. In fact, there was only one other educational institution on the list, Coursera (another resource I intend to use in the future, as its courses are free), at #40. Western Governors University has a motto that sums up its advantages very succinctly: Online. Accelerated. Affordable. Accredited. Hence, I begin with those advantages. More and more universities are offering online classes these days, but most of them still require you to come in once in awhile to sit for an exam or meet with a group. WGU, on the other hand, is 100% online with all the benefits that affords. For example, you save eons of time not having to drive to school, park, walk to a classroom and wait for a professor to begin. I figure, if I went to Colorado State University here in Fort Collins, I would spend 1.5 hours each day, five days a week, doing just that. That’s 7.5 hours of unproductive time each week in which I could have read four chapters already. Furthermore, I’ve usually found reading textbooks to be a much more effective way of learning than attending lectures. Maybe it’s partly because of my learning style, but it’s also because I can read three times faster than I can listen, plus I can stop, reflect on, and review what I’ve just read whereas that is not possible in a lecture setting without missing out on what the professor is saying next. Teaching ability of professors can also vary widely, as I discovered even at Stanford. In the instances where lectures are helpful—for example, in the mathematics-heavy subject of Financial Management—pre-recorded videos can offer more polished presentations than a professor who has to ad lib live. WGU provides such videos which can be paused, rewound, re-watched, and played at up to 2X speed. Being able to learn in the privacy of your own home eliminates the distractions that other students can cause. It’s also easier to take notes: you can frantically type at 90 words per minute without disturbing classmates, and everything online can be easily cut and pasted. At WGU, you even take the tests online with a live proctor. WGU sends you a webcam, and you can arrange to take an exam with Proctor U at almost any time of day (including midnight) and just 5-10 minutes of notice. The exceptions are holidays when Proctor U closes and gives their proctors the day off. While having a proctor watching you over the webcam take an exam inside your home might sound kind of creepy, that was not the case for me. I always found talking with the cheery and enthusiastic proctors to be pleasant and even encouraging. (Edit September 1, 2016) Apparently it is also possible to take exams at a local testing center (e.g., Sylvan tutoring center) near you. Thanks to reader Rosario J. for this added bit of info. At Western Governors University, you go entirely your own pace. You can start and finish a class (by passing its assessments) in as quick as one day, to as normal as 8 weeks (what the WGU pacing guides assume), to as long as you need. As discussed in the preceding subsection, having all the classes and exams held online helps with acceleration due to eliminating wasted time and not having to wait to take exams. The amount you accelerate is really only limited by your motivation, ability and circumstances. Western Governors University charges by the semester, not by the unit. In that sense, it is like Stanford (which charges by the quarter) and unlike a community college. Of course, WGU charges a whole lot less than Stanford. How much do they charge? When I started my MBA in November 2014, it was $3,395/semester. This usually places WGU in the top 5 in the lists of the most affordable MBA programs in the United States, and that is assuming one does the MBA in the more typical two years (or $13,580 total). Do it in less than a semester, and then there is no contest: WGU’s cost is only $3,395. If you qualify for financial assistance, tuition can be even less than that. In my case, I paid entirely out of pocket, but because the U.S. government gives education tax credits to just about everyone, I figure my final cost was around $2,500 or so. That amount is less than many people’s monthly mortgage or a 10-day vacation. Also, tuition at WGU includes all textbooks (electronic, of course) and learning material. There are no other hidden costs, which should be a relief to any college student accustomed to paying $1000/year for 500-page books weighing two pounds each. WGU is the first and only university to have received regional accreditation simultaneously from four regional accrediting commissions. According to About.com, regional accreditation is the most commonly accepted form of accreditation, and some employers prefer degrees from regionally accredited schools. Western Governors University is particularly innovative in that it follows a competency-based model. What is competency-based? It basically means you only pass a class, and are given a degree, when you prove that you are fully “competent” as measured by assessments. This is the same approach followed when you take a licensing or board exam to work in a particular profession such as law, architecture, engineering and medicine. But it differs from most schools because instead of giving you an A, B, C, D, or F for a class and a final grade point average, you either pass (“competent”) or receive no credit. Why is the competency-based model superior? For one thing, grades should not be meted out just because you have attended a class and turned in sub-standard assignments. If you receive a C or D in a class, are you really competent in that subject? In my view, anyone receiving those grades are still shaky in those subjects and should be forced to repeat them. Having a C or a D on a transcript provides no value to an employer. In fact, employers would likely view a transcript containing those grades negatively. Yet, most universities regularly confer degrees to students who have received such grades. In a competency-based model such as WGU, you cannot pass a class if you have not mastered the material enough to prove you are competent. You are going to have to keep studying or retrying until you know the subject matter thoroughly. You can take tests multiple times if you have to, but the same questions are never repeated, and WGU imposes a penalty (something like $60 and a two-week wait time) if you have to retake an exam a third time. This provides an incentive to try as hard as you can to pass the first time. When you have passed all your classes, you can rest assured you are competent and that you have achieved, in the words of WGU, at least a B equivalent average. Not having to worry about getting an A provides a couple benefits. One, of course, is reduced stress. Having to merely “pass” an exam induces a whole lot less anxiety than feeling you MUST score as close to 100% as possible (as I would feel in high school). The second benefit is less wasted time from over-studying. It could take 60 hours of studying, for example, to achieve 80% on a WGU exam. But to achieve 95% on the same test, you might need to study for twice that amount of time. It would be much harder to accelerate if the school used a traditional grading system, just because the student would feel compelled to over-study just for marginal gains. Most universities, even ones not named Stanford or Harvard, make you jump through all sorts of hoops just to gain admission and prove you are worthy enough to transfer tens of thousands a dollars a year to them from your bank accounts. These hoops usually include taking some sort of $200 standardized test like the GRE, letters of recommendations, a tax-form-like application with multiple essay questions and in-person interviews to “prove” your motivation. Because paying thousands of dollars of your own money for tuition is not “proof” enough. And then there is the long, drawn-out thrill of seeing whether or not you have been “accepted” and have the privilege of attending the fine institution… next year. All sarcasm aside, I think the hoops exist at most universities due to scarcity of resources. With a brick-and-mortar school, there’s a finite number of rooms and desks, professors and graders. Many, if not most schools, receive more applicants than they have spots for. (For a Stanford undergraduate education in 2015, for example, over 40,000 well qualified students applied for only 2,000 spots, for an acceptance rate of only 5%.) Universities thus erect the barriers to reduce the size of the applicant pool and also to select the ones most likely to succeed. In contrast, Western Governors University is entirely Internet based and has yet to reach the constraints of its resources. In 2014, WGU surpassed 50,000 enrolled students nationwide, and since it admitted its first student only 15 years ago, it is growing exponentially. Its admission process is easy, with only a simple online application and a friendly half-hour phone interview with an enrollment counselor to make sure the program would be a good fit for you. You also will need to submit your résumé and have your college transcripts forwarded to WGU. The normal application fee is $65, but you can get that waived by acquiring a referral link from a WGU alumnus. Email me and I can send you a referral link that allows you to apply for free. With most universities, there are usually only two or three start dates per year depending on whether they are on a semester or quarter system. With WGU, you can literally start any time after your application is approved, although your term officially begins on the first day of the month following your application approval. I recommend applying at least four weeks before you want to begin, or at least six weeks if you need to apply for financial aid. Unlike during high school and my undergraduate studies, at WGU, classes are only taken one at a time. I am not sure if that is how classes are normally done at other graduate schools, but it was a refreshing approach for me. This is because I am most effective when focusing on one thing at a time, and it was great not having to shift gears constantly from one subject to another each day, which would have otherwise severely slowed me down. I am not sure why such an approach is not taken in high school or college. Maybe it is to give students a constant variety of subjects so they would not get bored. It is also probably logistically more difficult to do so in a brick-and-mortar school. Doing one subject one at a time would require six hours in the same classroom for the same subject (to utilize the entire school day) with new classes beginning every month instead of every quarter or semester. A teacher would only get to know the students for a few weeks before they moved on to the next class. Still, from a learning point of view, I believe that focusing intently on one subject at a time enables quicker learning, and WGU enables this. Because all exams are electronic, you know whether you have passed them (and the class) the minute after you complete them. There is no waiting a week or more for results like I had to during college and high school. Even papers are graded relatively quickly. After submitting a paper to TaskStream.com, you can see where it is in the queue. WGU outsources grading to a third party. (Corrected August 2016) Evaluators employed by WGU then retrieve and grade your paper, strictly following a rubric. Papers are usually graded within two to three days, and the instant the task is marked as “requirements met,” the class is marked as complete. Many people go to college and even graduate school for the social aspect: to meet others their age and to have the social support of peers working towards similar goals. But at WGU, you work entirely independently except in the final Capstone course in which there is a group simulation project. The most amount of contact you have with a living person at WGU occurs during the weekly phone calls with your student mentor who checks in with you in support of your goals. You can “meet” other current WGU students through WGU forums and Facebook groups, but do not expect to make many friends this way, much less hang out and study together in person. Western Governors University is thus even less of a party school than another Utah institution, Brigham Young University. For me that was not a problem. Over the years I have met many interesting new people through other mediums, such as Spanish and French conversation groups, running clubs, Tuesday Night Track workouts, and my rock climbing clan. It was just as well that I could not make new friends through WGU because at the accelerated pace I was going at, I would not have had time to spend with any of them anyhow. If you go to Stanford GSB, you are likely to mingle with people like Steve Fossett, Phil Knight, and Mitt Romney (all GSB alumni). The classmates you bump elbows with will probably be big movers and shakers in the world. Those connections could be very valuable in the future. There are no such networking opportunities at WGU. If networking is important to you, I would suggest spending some time attending local business and entrepreneur gatherings and Meetups. You could also try hanging out online on networking sites such as LinkedIn. In my case, I probably could tap some of the alumni resources provided by Stanford. Western Governor University classes are not like regular classes, where you can (sometimes) interrupt a professor to ask him a question and get an immediate answer. However, each class has course mentors. My experience with them was mixed. There were a couple classes where I e-mailed the course mentors questions related to the course materials and received replies that were immediate but merely said, “I’ll look into it and get back to you.” And then the mentors never followed up and I had already moved on to the next class. But I am pretty sure if I pressed the issue I could have gotten a more satisfactory response, and for more urgent questions I could have picked up the phone and called them during office hours instead of emailing. Below is my actual timeline for obtaining a Master of Business Administration degree in 4.5 months. There were a total of 11 classes, with each one being three units except for the final Capstone class, which was four. The bulk of my papers were 11-18 pages long, with one task being 4 pages and the final real-world business problem being 30. If you remove the cover and reference pages, that is about 135 pages worth of papers (double-spaced in American Psychological Association format). In other words, WGU’s MBA program required writing the equivalent of a novel. Note: There is no page length requirements for papers. I listed the above to give you an idea of how much writing you can expect to do to complete the assessments. How long your papers would be depends entirely on how concisely you write to fulfill the requirements of the rubrics. The way exams work at Western Governors University is before you can take a “real” exam, you must take a pre-assessment exam which mimics the real one. Once you pass the pre-assessment, you ask your student mentor to allow you to take the real exam. Completion of a pre-assessment generates a helpful coaching report of the topics you should study more. Generally, I thought the real exams were of equal or slightly higher difficulty than the pre-assessments. However, the number and type of questions were exactly the same. The exams were multiple choice and difficult enough that I honestly did not feel I could have passed any of them without reading the chapters in their entirety. But keep in mind that I’ve only taken one business-related class previously in my life, that being an Engineering Economics course class at Stanford. I know of at least one WGU alumnus who said he was able to pass a lot of the exams by simply taking the pre-assessments, then figuring out what he missed and reviewing pertinent chapter sections, and then taking the real exams. However, he was a business major as an undergraduate so most of the material was not new to him. The most difficult classes—aside from the Capstone class—were the Data-Driven Decision Making and Financial Management classes. Actually, for the math-heavy Financial Management class I did very well, scoring 88% on an exam that had a cut (passing) score of 61%, but you might expect that for a financially independent mechanical engineer. The Data-Driven Decision Making class was truly difficult and I barely passed the pre-assessment, due in part to not taking it as seriously as I probably should have after passing the exams in all previous classes. That was a wake up call for me and I ended up using the whole two hours allotted for the real Data-Driven Decision Making exam. I passed that with a 12% margin. It took me just over three months to finish the first ten classes, or about one class every 10 days. In contrast, the final Capstone class took six weeks. There were a few reasons why the final class took me so long. First, it was simply a ton of work. There was a surprising amount of pre-work to be done before engaging in the Capsim team simulation, and I also had to meet with a local business to solve one of their business problems as one of the other assignments. Then there was doing the simulation itself and writing a couple papers and a PowerPoint presentation for that, and writing a 30-page paper for the business problem solution. To cap it all off, I had to do an oral presentation. Mine was 17 minutes long, which required a lot of rehearsing. Then there was the matter of working with teammates. All three of mine were very smart and hard working but had full-time jobs and families to tend to, and therefore were doing their MBAs over two or three years. Thus, we had to work at a slower pace than I was accustomed to. Because I had more time, I was CEO of the group and happily took on extra roles, including spending a bit of time trying to get a team member up to speed when he started falling behind due to his employer making him work 22-hour days on business travel. Ultimately, this team member had to drop out of our group due to the insane work schedule, reducing our team to three and having me take on yet another role to fill in for him. The remaining three of us had a passion for excellence and as a team we were super competitive, so in the eight competition simulation rounds (which simulated eight years of running a sensor-producing business), we did not let up and spent more time than was probably necessary to pass the simulation. In the end it was worth it. 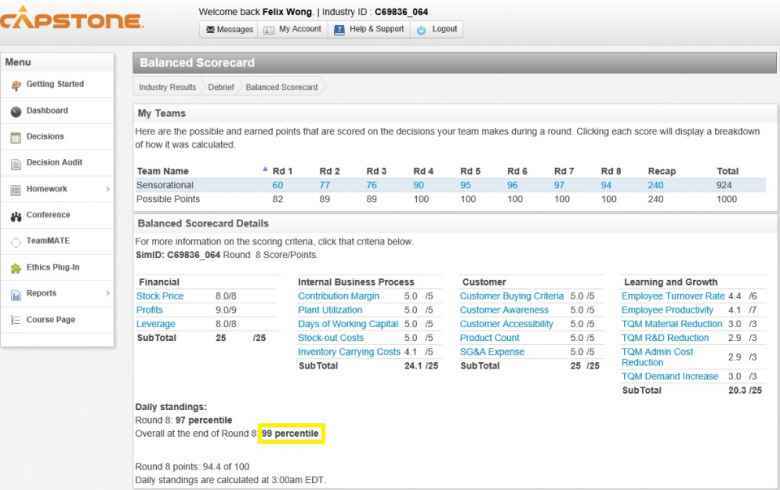 My team dominated and completed the simulation with a final score of 99 percentile, the highest possible that can be achieved. (We only needed a score of 50 percentile to pass, which actually seemed like a challenge when we were doing the practice rounds due to the complexity of the simulation.) I was extremely proud of my team and I do not think any of us would have traded a faster completion time over our score, a score that earned us a spot on Capsim’s webpage of distinction and also a nice letter and certificate from WGU. In this section, I give advice that could help you finish a WGU MBA more quickly than you might have imagined. Use an APA-formatted template for Word provided by Microsoft itself. You can do this either by one of two methods: (1) open Word and then in the “Search for online templates” field on the initial page (which allows you to create a new document) search for APA and select APA style report (6th edition), or (2) download the template and then open it in Word. Papers must be in APA format. The template is extremely useful, especially for citing references (in Word, click on References->Insert Citation in the menu ribbon). Do not bother to spend hours like I did going through WGU’s Center for Writing Excellence website to learn how to format a paper per APA guidelines. Create outlines for papers before you begin writing them to organize your thoughts. Follow the rubrics for each task; they tell you exactly what needs to be in your task submission for you to pass. Use video editing for the oral presentation of the final Capstone class; it is explicitly allowed. I split my oral presentation into multiple segments and spliced them all together using Microsoft Movie Maker, and then uploaded to WGU’s Panapto website. I had to do multiple takes for each segment to create one polished presentation. The alternative is to do the (approximately 17-minute) presentation in one shot, which I could have done but would have required (at least for me) several days of rehearsing. Watch the case study videos; they were very interesting and helpful. This includes even the cheesy ones with third-rate acting; I thought they were very effective in making their points. Watch the other videos at 1.5X or 2X speed on Panapto. Definitely watch the very helpful Capsim Demonstration video by Professor Loretta Davis for the final Capsim simulation project. That video otherwise would have taken 45 minutes to watch, but at 2X speed, it took only 23. Take screenshots of each question of the pre-assessments. Then, after finishing the pre-assessments, try to figure out which questions you missed. Taking screenshots of each question of the pre-assessments is no longer necessary because the Coaching Report for the pre-assessments tell you which questions you got right and wrong, along with the answers. An effective way to improve on anything in life is to figure out mistakes you made and learning from them. Do not bother with the forums or Cohorts. Once in a while I visited the forums for tips from course mentors in regards to specific tasks, but tuning in to forums or Cohorts was usually not an efficient use of time. If you get really stuck, contact a course mentor directly. Take notes using a note-taking program such as Microsoft OneNote. I could sing the praises of OneNote all day. It has been the single biggest enhancement to keeping my life organized since I’ve adopted it a few years ago. It synchronizes to all devices instantly and makes clipping notes from a variety of sources super easy. Evernote is also a good option, but I prefer OneNote especially since I am happily entrenched in the Microsoft ecosystem. Either is far superior to pen and paper. Learn how to read faster if you haven’t already. Back at Stanford, I took a speed-reading seminar. It was only an hour or two long, but has probably saved me days, if not months, of reading time over my lifetime. Using its principles, I could read a business school chapter every 1.5-2.5 hours with full comprehension. When you have 142 chapters to read in total, it behooves you to be able to read even slightly faster if you really want to accelerate your learning. Adopt the motto “once and done.” Strive to pass the pre-assessments, exams, and papers on your first try. Having to redo them wastes time. I was able to pass everything on my first attempt, although I did have a close call with the C207 pre-assessment as mentioned earlier. Use every moment of the day. Eating breakfast? You can study during it. On your lunch hour? Ditto. In today’s mobile world, it is easy to whip out your cell phone and do some studying while standing in a grocery line, or waiting for someone to show for coffee. Reduce your life to the basics if you are serious about completing an MBA as quickly as possible. I even went six weeks before doing any cleaning of the house. Hire a housecleaner and gardener if you need to; remember that finishing earlier will easily pay for them in terms of reduced tuition (in the case of finishing semesters early) and the opportunity cost associated with time. Before I commenced Western Governors University’s MBA program, I wondered if I could go back to being a full-time student. I had been out of college for a whopping 17 years and have quite enjoyed having my evenings and weekends free without having to worry about having some exam to study for or paper to write. The first week of the program put those concerns to rest. The material was super interesting and engaging. I experienced no eye-strain while studying in front of the computer(s) from dawn to dusk. Despite usually studying alone at home (which I found to be much more efficient than at, say, a coffee shop), I did not fall victim to loneliness and despair. In today’s world, it’s easy to keep in touch with other with a simple text on Google Voice, or a quick email over Outlook. During my graduate studies, this was usually enough. I had to cut back on things such as freelance work, news reading, weekly rock climbing, exercise, house projects, blogging, French Film & Culture Club, and general socializing, but it was actually liberating to pare life to the bare essentials. No longer did I waste energy noticing what shenanigans Kim Kardashian or Justin Bieber were up to, nor did I bother to do things of trifling importance such as cleaning until surfaces began to get too gross. What I had to do each day was already laid out; all I needed to do was execute efficiently and effectively. Eventually I did begin to miss the level of physical fitness I attained last year and definitely the company of my friends. But 4.5 months was a short enough period of time that neither were lost for good. Could I have done the MBA program any faster? Probably. For one thing, I did get distracted by the holidays, the NFL playoffs and Super Bowl. Another thing is I did not take any shortcuts. If my sole objective was to get an MBA, I probably could have read less of the material, foregone all the videos and auxiliary reading links, spent less time proofreading my papers, spent many fewer days on the Capsim simulation, and still would have passed the classes. But a big part of my goal was to learn as much as I could about business through the program. Indeed, within those months, I learned more than I have in the last 10, maybe 15 years. 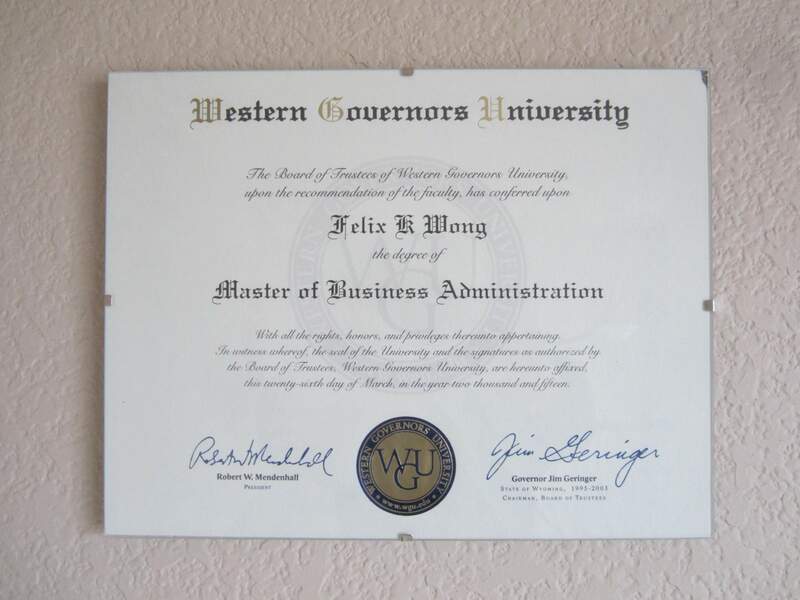 The quality of the MBA program was outstanding and I would highly recommend Western Governors University to anyone. I believe its online learning model and competency-based approach is the future of education. But ultimately, regardless of whatever university you enroll in, the quality of your education depends on how you make the most of the resources that are available to you. What’s next? Educationally and professionally, there’s still some stuff I want to learn about, including 3D printing, app writing, and becoming a better public speaker. And considering that this master’s degree took half the time I had originally planned on, it is mighty tempting to do another graduate degree—especially if I could do it in another 4.5 months. That would give me as many degrees as Shaq. But instead, I think I will take a break. I may even take a vacation or two. do the Trans Am Bike Race. Even the Big Diesel needs a little rest. This is incredible. Really provides that validity that many of us are silently seeking while attending an online university. Thanks Jayson. I am definitely sold on online universities after this experience! I was amazed at your accomplishment! Great job! Thanks for inspiring me. Thanks, Sonny, and best of luck on your own educational journey. Felix, wonderful achievement and a fantastic write up. Looks like you have gone from ultrarunning to “Ultra Education”! head down and burning through non-stop. The wealth of learning possible e.g. through Coursera is incredible. However the biggest challenge I find is sticking with those courses when there are no mandatory exams, peer pressure etc. and I am otherwise distracted by the priorities of a full-time job. I think the Massive Online Learning model is the way to go now but still needs to evolve if institutions like Coursera are going to see improvements in completion rates. At the moment it feels too much like a Las Vegas buffet, lots of great learning to chow down on but can lead to decision fatigue. Anyway you have set the bar high! Congratulations. Hi Jim, great to hear from you. I think you are right about those challenges for Coursera and the massive online learning model in general. In that sense I can see how Western Governors University can be more effective—or at least results in a higher completion rate—as it charges a nominal, but not insignificant amount, to ensure the student is committed. It also provides a financial incentive to finish faster: finish in fewer semesters, and you save thousands of dollars. But I am all for the free model Coursera provides since for many people around the world, even a few thousand dollars for education is just too much. I haven’t done a Coursera class yet but intend to later this year. At least it provides certificate of completion—something good for posting on a LinkedIn profile or at work. That is one external reward that can be motivating! Maybe Coursera could try using other tactics that, for example, Duolingo uses: virtual currency as rewards, streak tracking, social networking for peer pressure, and weekly/monthly points comparisons. You made a great analogy about a Las Vegas buffet, decision fatigue, and putting more food on one’s plate than one can possibly chew. Reminds me of what Satya Nadella said about himself when he became Microsoft’s CEO: that he loves learning so much that he signs up for way too many classes and thus, as with books, there are many he has not finished. 3. Only write paper based on rubrics (never read chapters)? Also, did you ever follow any of the cohorts plans? Hi Billy. I did (1): read all the chapters and wrote the papers using the rubrics to make sure I sufficiently addressed all the points. I never followed any of the cohort plans. It maybe be possible to write the papers doing (2), but I highly recommend reading all the chapters. For me, C200 was the most interesting course since it really analyzed what makes people and organizations great leaders, and contains fascinating case studies. Best of luck and enjoy the class! Thank you Felix! that is helpful. I have just started my MBA in IT this month. I find your blog useful. It is very thoughtful of you to share your experiences and success. Thanks Felix for the reply and insight. What an inspiring article, Felix! I just completed an undergrad in business management from WGU and was debating whether to do the MBA. The 1st undergrad was in modern languages and I wanted something “practical” to balance it. Wasn’t sure if I wanted to take a break or continue and you’ve inspired me! THANK YOU! Thank you, Cammie. And congratulations on completing your second undergraduate degree; what a great achievement! If you do continue on for an MBA, I’m sure you will find it rewarding. It’ll probably be pretty easy for you since you have a bachelor’s in business management already. Best of luck and thanks again for your comment! Hi Heather..Congrats on this superior achievement. I’ll be starting it next month and hope to do it in under 6 months. Did you have prior knowledge of the subjects? Can you help with some tips, please? Felix, great job! Your name sounds familiar I feel like I’ve seen your name in Coursera’s forums. Thanks for sharing. I’m doing my MBA at the moment and found this post very helpful. I’m pretty much on the same boat and have the same sort of aspirations. I’m taking it a bit easier though as I have a family to take care of haha WGU has been a pleasant journey so far. I’ve completed three courses in 30 days and currently doing the management communication course. It seems like the fun’s just started and bigger challenges are awaiting! What an accomplishment! I currently am enrolled working on my MBA. I did have a question about the assessments. I am fixing to take my first one which is for C211, Global Economics for Managers. I did really well on the pre-assessment. Is the real test similar to the pre-assessment. I have been studying a lot from that. Once again congrats to you! I’m about to turn in task 2 for C207 as soon as the originality report comes up! Thanks for this write-up about your experience. I will be entering the Capstone soon, and it’s helpful to read about other student’s experiences. I have a full-time job, a wife, and two kids: girls seven and sixteen years old. I wonder how long it would take me to complete? Great post Felix. Thank you for the detail. My situation is the opposite of yours. I only need any RA accredited masters to enter a very expensive, extensive state certification program that could lead to a big career leap. My honest question (and judge if you must) is how hard is it to just get by and pass? Quickly. Not concerned with being tops in calss, bettering myself or gaining oodles of business knowledge. I need an RA accredited degree as cheaply and quickly as possible and want as little red tape or wasted time as possible. WGU seems to be the best option. Any responses would be greatly appreciated. Like the last poster I have a FT career, wife, kid, band, many commitments but I have a fairly solid business foundation, am an adept writer and decent test taker. I got a 525 on the GMAT cold without studying at 49 yrs old (was interested in the U of Arkansas Ops Mgmt online program). Thanks and best of luck to everyone in your endeavors. Hi Mike. To simply get by and pass, WGU’s MBA program could be done several weeks quicker than I did it. Some shortcuts could be taken, such as not viewing any video or reading supplementary information, and just intently reading chapter summaries for chapters you are already knowledgeable in. You sound like a smart guy with a lot of existing business knowledge already so I believe you could do it. For the classes with only papers as the assessment (such as the first class, C200 Managing Organizations & Leading People), you could probably read even less—just finding and citing material to back your arguments. For the classes with exams, I know of at least one person who was jumping right into the pre-assessments, figuring out what he got wrong, and then taking the real exams—passing all of them on his first try. He even did one class (C215 Operations Management) in less than two days! The exams are actually difficult enough that I don’t think I could have consistently passed them with his method (immediately taking the pre-assessments, do limited but focused reading, then taking the exam), but he proved it can work for some people. The quicker you do WGU’s MBA program the more focused and organized you will need to be. In your case, you’d also need an understanding and supportive family as most of your free time would probably have to be devoted to studying and doing the assessments. I’d say go for it and challenge yourself to do it as quickly as possible—say, 2.5-3 months. The worst case is you might have to retake some exams and/or lengthen your timeline. But if it ends up taking 4-6 months, that’s still great, and it costs no more than even shorter amounts of time. Best of luck and if you do decide to do it, please come back to my site and give a report on how it went! Felix, found your post when I was searching for insight on the WGU MBA and trying to decide if I wanted to give it a go. It was (and continues to be) a real inspiration–I’m 6 weeks in with 5 classes done. I don’t know if my job will allow me the time to power through in just one term, but I’m going to if I can manage it. Thanks for such a great post! Tricia, you are doing fantastic! Five classes in six weeks while working is amazing. Best of luck with the rest of the classes and please let us know how they go! I would just like to add to all of your comments a different perspective on WGU. I took the opportunity to take early retirement from IBM at age 55 and enrolled in WGU “for something to do.” Because I knew I didn’t need an MBA I decided to take the M.Ed. which took me the full two years because it was totally outside of my life experience over 37 years of working in the Fortune 100. Then, I decided to take the MSML. I completed my first 5 or 6 classes in 4 or 5 weeks. Now the fact that I completed the classes so quickly does not make me a smart person (though at age 56 I am pretty proud of getting 3 Masters Degrees in under 3 years) but it does absolutely prove the WGU competency-based module. I have been able to breeze through the MSML and expect no problems with the MBA because (with the possible exception of that miserable Effective Leadership class Dr. JOB mentors) WGU is evaluating competency on E-X-A-C-T-L-Y what people are going to experience in the real world. I read your post and I am very impressed and excited about starting at WGU! I will be pursuing my MS in Accounting so I know that is different from the MBA. I wish I could find information on this program. You have greatly motivated me because I am single with no kids but I do work full-time. It is my hope to finish my degree within the 6 months! Thanks for sharing! Glad I found this. I am just now considering my MBA. I have taken many post grad classes and they have been so time consuming and expensive that I have put off my MBA. I worry most about family time and kids sports in the evenings. I want to get my MBA for many reasons and WGU seems like the best option both financially and time wise. Un millon de gracias Felix! Estoy en el mismo programa, si tienes mas advice, lo agradesco mucho! Quiero terminar en 4 meses. Btw estoy comensando cycling tambien. De nada, Vivian. Â¡Gracias por su mensaje y buena suerte con el programa y ciclismo! I have been researching and embarking on a quest for a master’s program. There were many factors in trying to reach a decision, i.e. go for a big name public school institution, or try to minimize the hassle, cost, and jumping through hoops. Thank you for your well written post, a wealth of information on the WGU MBA that was both enlightening and inspirational! I completed my Business Management Undergrad at WGU. It was a great experience. I don’t actually know what I want to be when I grow up so I have now decided to get my MBA. I hope this will help me in the direction of a career. Thank you for this blog post. It was more than informative and I was starting to wonder why I decided to take this next step in my journey and you reminding me. Have a great day and good luck with all future endeavors! Thank you SO much for writing this Felix. This give me goals, reassurance, and foresight. I’m hoping to get this done in 4-6 months. I’ve just finished my first class which took me two days longer that the bar you set but I only can utilize 4 of my 7 days a week, have a brand new puppy, and have two kids, one of which is mentally impaired and time consuming. Your blog is an inspiration and motivation for me. I truly appreciate it. Hi Melissa, thanks for stopping by my website and for your comment. You are doing GREAT especially considering you have two kids and a new puppy! Keep up the great work and feel free to drop me a line anytime you need advice or encouragement. Best of luck with the rest of the MBA program! Hi Felix, what type of advice can you give to prepare for “Global Economics for Managers”? I feel so lost with this subject. Thanks! Global Economics for Managers was one of my favorite classes. I loved how it talked about the challenges multi-national enterprises faced and how economies around the world were intertwined. In reviewing my notes, it looks like the assessment was one exam. I would suggest reading all the chapters in the order suggested by the Pacing Guide, copying and pasting important points into your note-taking software (I like OneNote) along with missed quiz questions. Then give them a once going over before taking the pre-assessment if you are not feeling confident about it all. When taking the pre-assessment, I recommend taking screenshots of every question. Then, after you finish taking it, review each question and try to guess which ones you missed. You will receive a Coaching Report after taking the pre-assessment that will summarize which subjects you scored highest in and which ones you should review. I really enjoyed the videos for this class and thought they were helpful. If you get confused about certain subject material, feel free to drop the course mentors a line for discussion or clarification. Thank you for the great information here, Felix. I completed the B.S. in IT in a tad over two years while working full-time, and I am starting on the MBA IT degree in a few days. I am not really in a hurry, but hey, for 3000 dollars, that is an MBA that is quite worth it. I am fortunate to read this post and I am highly motivated by your achievements Felix Wong. I am starting the MBA program on November, 2015. I am aiming for four months to make sure I do not go beyond six months. Again thanks Mr Felix for your inspiring post. I hope to emulate your success. Hi there. I’m about to start my MBA on January 2016. Thanks for this wonderful blog, now I’m super motivated. I just applied to the WGU MBA program on Monday. Even more excited after reading your post! Thanks for the great breakdown. Congratulations on the great achievement. Your experience is truly inspiring. I’ll begin my MBA at WGU in two weeks and plan to be done in under 6 months. Could you, please, help with some questions here if you have time? 1- C207 and C214: any tips or pre-reading I can do now to make it less difficult? 2- Overall, do you advice taking a quick course on coursera or edx that has similar content to WGU prior to tackling the actual course; aim is to reduce time taking the actual course by pre-reading the material now before the clock begins to tick? 3- Does WGU allow you to take exams on weekends? 4- If scoring research papers takes 3 days and you moved from one course to the other almost instantly, does that mean they allow you to move to the next course even before you knew whether your paper met the requirement? Does it mean that in most cases those papers are accepted? 5- Any shortcuts on writing the papers that could help save time? 1. The moment WGU approves your enrollment (I think this happens after tuition is paid), you can start accessing the syllabi and reading materials for all courses, even before your term “officially” begins on the first of the month. So you can start looking over the material for C207 (Financial Management) and C214 (Data-Driven Decision Making) now if you’d like. The math required for both of those classes require nothing more difficult than algebra and probability and statistics, and will be reviewed in those classes. You can also use an approved Financial Calculator (e.g., Texas Instruments BA II Plus) which, if you’d like, you could obtain and learn how to use now. 2. I do not know of Coursera or EDX classes that would be similar to the WGU courses. I do feel that the reading material for WGU’s MBA program is excellent and everything you need to pass the assessments are contained in the material. 3. Yes! You can take exams on weekends. Beware of holidays, however–Proctor U was closed on Thanksgiving and for half a day on the day before Thanksgiving, if I remember correctly. The same goes for Christmas; I can’t remember if it was closed on New Year’s Day. The great thing is you can schedule exams as early and, most of the time, as late as you want. E.g., “right now” or even at 11:00 P.M.! 4. Correct, you can move on to another course even while assessments are being graded. You do not even need to be officially enrolled in the class yet (class enrollment occurs with your Student Mentor’s help) to have access to the material—you have access material for all courses in your degree program as soon as you are accepted as a student by WGU. 5. For writing papers, create outlines first containing everything you will put in your paper, including supporting citations, to meet the requirements laid out by the rubrics. Then, writing the papers is easy. Don’t worry too much about how well the papers “flow.” What is most important is the content: that all the requirements of the rubric are met. Hope this helps! Best of luck! Thanks very much, Felix. You are truly a great guy. All the best with your career. Congratulations! I am really impressed about your dedication. I just started the program and I have a question about the C202 Managing Human Capital exam. It is a multiple choice exam? how many questions? Thank you. Thanks Taty. Regarding the exams, they all contain only multiple choice questions with four possible choices. The C202 exam has 70 questions. I think the time limit was two hours, which was maybe double the amount of time I needed. Best of luck! This was an interesting read. I’ve been in the BA (Business – IT Management) program at WGU since Nov. 1st. I’ll be completing my fourth class this weekend and hope to get my BA by the end of next year. I was going to wait to take my MBA, but you make it sound like it’s worth the season(ish) to just go and do it straight away. Very inspiring! Hi Ryan, thanks for stopping by my website and for your comment! Guess you are just about wrapping up your fourth class this weekend… congrats on that! I do recommend doing an MBA after your BA; as you saw from the post, it can be done very quickly and affordably and I think it will give you a tangible advantage over other job applicants in industry. Best of luck with the rest of your BA and possible future MBA! I really enjoyed reading your post. I have just discovered WGU and I have been debating which Master’s program to begin. My undergrad degree is in Human Biology and I have never taken statistics. I am ok at math, but not great and it’s been a long time since I have used it beyond basic computation. Therefore, I was considering the MS in Management and Leadership. I will be paying out of pocket and finishing in one term is my goal. I would rather use my money wisely and finish the degree in one semester. What’s your take? Hi Rosario, thanks for stopping by my website and for your comment! For WGU’s MBA program at least, never having taken statistics or advanced mathematics for that matter would not be a problem for you. I thought the course material explained concepts well and did not assume that you knew much about probability and statistical methods already. You would be wise to do a master’s through WGU and within one semester. As long as you focus, you would indeed save much time and money, especially when factoring in opportunity cost, versus degrees from other universities. You will learn a lot and I think a lot of what you learn (e.g., leadership, communication, financial analysis and decision making techniques) can applied not only the business world, but real life! Like many others above have said, thank you for helping put my mind at ease in regards to the quality of the MBA program. I was so excited to find the program, I just kept looking for potential problems. After reading your experience, and several others, I am enrolling! Thank you Felix! Would you please provide me with the referral link? Hi Sarah! I sent you a referral link to your email address this morning, but the email bounced! Could you send me it again? Thanks! I am seriously considering applying to WGU and powering through my MBA with them. I really appreciated reading your take on the program. Can you email a referral link, too? Thanks! Thanks Felix!!! I did my undergrade at WGU and completed 74 CUs in 10 months and now I’m starting my MBA there in February so these tips were very valuable! Starting my WGU MBA in March! After reading this I am even more pumped!! Thank you for your inspiration. I don’t think I’ll be able to finish in one term – FT job, family, house, etc. – but I completed a sit-in AA degree in IT in two years just last Fall, and could have gone much faster had I been able to set the pace the way WGU allows you to. I already have a BA (not in business or IT, obviously), so I’m starting in on the MBA in IT Management in April. Very excited to start the journey and move out of being a minion – leadership for me, thank you. I had toyed with the idea of a more IT-focused degree, but I think the MBA with a small IT focus will be much more flexible if I decide to chase other opportunities in the future. It’s also loads cheaper than a 1-year degree at a state university. Hi Luke, congrats on finishing your AA degree last fall. I can imagine your anticipation on starting the MBA in IT in April and am sure you will find it worthwhile. Like you said, it is a great value. Good luck and thanks for stopping by my blog and for your comment! How difficult was finding a business problem for the capstone class. That is my one concern, do I just walk in to a local business and ask?!? I am definitely very interested in the program. My undergrad is in Business Admin with a focus in marketing. I need a Masters Degree to advance in my job. A MBA would be a natural fit for after I retire for second career (I am in the military) but I only need a Master degree to acheive my immediate goal of advancing so going back and forth between MBA and MSML. Any thoughts would be greatly appreciated. Hi Andy. It is not difficult asking a business problem for the Capstone class; most businesses would love to have a consultant come in and offer to solve their problems for free! You could very well walk into a local business and ask. Or you could ask people you know who are business owners or employed by a corporation. I think a few people wrote about their own businesses or family businesses. I’m not sure if an MBA or MSML would be best for you, but if the goal is to complete a quality Master’s program related to business as quickly, conveniently and affordably as possibly, I would highly recommend doing one at WGU. I graduated with an MBA from WGU few days ago and I did that in 64 days (Jan 1-March 4). I just wanted to thank you a million for all your help and tips that helped me a lot complete my MBA in 2 months. It was well worth it. Thanks very very much. I am also happy to help any current or future WGU MBA student with tips and strategies. Hi Rany. Congrats on your MBA! Sixty-four days is incredible… that’s got to be the record time, or close to it. At least it’s the quickest I’ve heard of anyone doing it! Are you planning on doing any more online programs in the future, like another masters or doctorate? If you come across anything that could be done quickly, please let me know. I would be interested! Thank you so much for writing this. A great many anxieties are put to rest by reading your process. I have an AA in business and am starting the BA in IT management next month and plan to go straight through to the MBA program. I had intended to finish my BA at CAL and then MBA at Stanford but could not afford either. Now with 18 years of high level IT experience and the promises of this program (affordable and much better use of my time) I’m really excited to finally meet those goals. I’m very glad to hear a stanford grad sing praises. Did you find that your work experience and self education caused some classes to be more just a test to prove your existing knowledge or for you was it all fairly new material? Hi Dave. I would say maybe 70-90% of the material was new to me, depending on the class. I certainly would not have passed any of the assessments without taking the classes and felt the program was well worth it. Good luck in the IT and MBA programs. Kudos to you for going back to school after 18 years in industry! I am VERY jealous that it took you such a short amount of time. 🙂 In 4 months, I had only finished 4 classes. I feel like I’ve been in C211 forever, but I’m taking the OA tomorrow, so hopefully I pass and can speed on through the rest of this term. My issue is balancing my workload with class (which is weird, since it wasn’t an issue when I was an undergrad and had 4 jobs). Has anyone gotten their MBA from WGU and then gone back to get an additional Bachelors? That’s my plan, although I’m sure it sounds weird. My goal is to be finished with the MBA – IT Mgmt by February 2017 and then do the BA in IT Security in a year, or less. I am in C211 now, slacked off a few weeks as work demands picked up. Read 6 chapters this weekend to get caught back up. I like the material, but will be glad to have this one finished. Good luck! I realize this post is old but still hoping to get your feedback. I’ll be starting the MBA healthcare mgt in July and would like to accelerate as much as possible. Is there any reading material, videos etc. you could recommend for me to do prior to the start to help me build knowledge on the subject matter. Thanks and congrats on such an amazing accomplishment. Hi Kerry. As soon as you have registered, you will have access to 100% of the learning material from your classes—enabling you to get a head start. What you can do is apply and pay for tuition early, but set a start date for July 1. You’ll have access to the material before July 1. You could quickly skim chapters or jump right to the chapter summaries as a good primer. Otherwise, I have no recommendations for other auxiliary material. The material WGU provides is really all you need. Good luck! A shout out to you, Kerri. I am also starting. MBA Healthcare Manageme in July. I started February 1 and have completed 3 classes so far. I work full time and have a family but find it easy to study and complete my assessments. It is a lot of fun for me because I can go as fast as I want without waiting for classmates or a professor to set the pace! Like you, I have always learned best by reading the textbook and find sitting in a classroom to be a waste of time. I’m seriously considering going to WGU for another degree at some point after I finish my MSN. Glad to read about someone else who loves the WGU format! Hi Betty. Thanks for stopping by my blog and for your comment. Great job on getting 3 classes done since February 1 already. You are doing great! I am really sold on the WGU way of teaching and learning. I would love to get another degree from WGU too. If they had something related to mechanical engineering or computer science, I would be all over that. Best of luck with the rest of your MSN! Hi, thanks so much for the detailed post! I’m considering an MBA for similar reasons as you listed; also my sister’s husband finished his bachelor’s in business through WGU and had all good things to say. Are any of the MBA reading materials available through e-book format, and can I watch/listen to the lectures using a cell phone? I’m asking as I’m a serious runner and I run 100-112 miles per week in season. I get through many books quickly using an app I have that reads e-books aloud as I run, also I have listened to coursera video lectures while running as well (much of the time there’s no need to watch just a talking head). This would save a lot of time if I could listen to the materials while running. Thank you! Hi Amie. Wow, you run a lot! Do you run ultras? I’ve run a couple 100-milers but my last one was in 2010. Sounds like you have a great system for both running and learning at the same time! As far as I could tell, the MBA reading materials were not available in an e-book format that allowed listening to on a cell phone. There aren’t a lot of traditional lectures, either. The ones with Powerpoint presentations (e.g., the Financial class) showed math. That said, there might be a way to download or print the reading material as PDF files that maybe your app could read to you when you run. If you figure out a way, please let me know! I haven’t played around with that technology much. I’ve listened to, say, Pimsleur Mandarin audio lessons while running, but I am really bad at multitasking so doing so either slows down my running or reduces my comprehension a bit. Hi Felix, yeah I’ve done some ultras, mostly the 50K-100K distance. I did qualify for the Western States 100, so we’ll see what happens with that! But when I run that much mileage it’s hard to fit anything else in haha. I like the marathon though. Yes, the app will read PDF formats, so I’ll have to see. I have converted other formats directly to PDF and it has worked. It will also read several other formats so I’ll let you know what I find out. I guess I run so much that listening to something has become second nature (music, audio books, lectures or e-books) and I think I am what is known as an auditory learner, I like to learn by listening. If there is something I want to take notes on, later I will quickly re-skim the material and jot down the salient points. If I am doing a targeted workout such as speed work/intervals, a tempo run, etc, I can’t/don’t listen to books, but those runs make up a small percentage of training when you run high volume. Recovery runs/general aerobic/long/trail runs are all fair game, especially trails as there’s no traffic, but I run a lot of rural roads that don’t have a lot of traffic as well. I’ve also watched lectures while running on a treadmill (or another type of stationary exercise machine). I have also built my own treadmill desk. I guess you find ways to work in what is important. Haha thanks! You even built a treadmill desk! I would love to see it. Wow cool. I just put in a “Fitdesk” bike in my greenhouse, not for a serious workout, but just some exercise outside when the weather is sunny. Having gone through the program, for what areas do you feel the WGU MBA is best suited to prepare someone? Entrepreneurs? People who want to work at large corporations? Smaller business management types? Thanks! I found a photo of the Fitdesk bike online. Looks pretty cool! Regarding WGU MBA’s program, I think it is best suited for people who work at large corporations or even small companies. However, even solo entrepreneurs will find some value in it. What a great article.Good job.you should be proud. I am curious of the speed reading with full comprehension. If there was an online seminar or something along those lines you could recommend to me, that would be awesome. I feel like that is such a valuable skill. Thanks! Hi Jesse. Thanks for stopping by my blog and for your comment. Pay attention to structure even before you being reading; e.g., by reading the table of contents. That gives you overall context right away. Using your finger (running it across the lines of the page) can help you move your eyes along and prevent regression. Try looking at chunks at a time; e.g., three words with each glance instead of just one word. Know where important content is usually located. E.g., for a newspaper article, reading just the first one or two paragraphs often suffices because that is where everything is summarized. Whereas in a textbook chapter, key points are often re-emphasized at the end of a section or chapter. You can force yourself to read faster for certain types of books. E.g., non-technical books like fiction or novels can be read quicker than math or science books. I would put most of the reading for the MBA program in the former category (fairly easy reading where even the new vocabulary is fairly easy to remember). If you find a good speed reading course, please let me know. Good luck! Thank you very much for you time and response.I will try a few of those suggestions. Thanks again. After a few days of reading with this strategy I have noticed that it can be very time friendly. The retention rate seems to be there and I have noticed that not wasting time reading words such as a,is,the, and, or, along with others helps speed the process along. April 1st is my official start date. I have started on one of my class books to try and get a headstart and am transferring in 40 credits. I hope I can get through this program (teachers college, int. disciplinary studies) much quicker than my degree plan figures. If you have any advice for me please share. The knowledge you possess about life and this school has already been beneficial, thank you. Also, I am interested on the different ways you have achieved financial independence?-any stocks? That is great that you are already reading faster! I think you are going to do very well. I don’t have many tips aside from what I had written in the original article, except to set goals for every single day and then try to beat them. Regarding Financial Independence, one important lesson from the MBA Capstone course was to use your assets as much as possible. Minimize frivolous spending, make as much as you can, save as much as you can and then invest as much as you can save. There are many investment strategies and they all depend on your short- and long-term goals. Stocks and bonds (or index funds representing those classes) should be the foundation, with real estate probably being next. A GREAT book I read right after my MBA is Tony Robbins’ book entitled Money: Master the Game. I highly recommend it, although it is really long (it took me 3 weeks to read it, and then getting through his checklist took a few additional days). Consider it another course, but one that costs only $15 and is worth tens of thousands of dollars. Another book I would recommend that I read 15 years ago that got me started on the road to financial independence is a book called Your Money or Your Life. It’s an inspiring and enlightening read. Great article and great achievement. I am interested in getting an MBA and WGU is one of the schools I am looking at. Just curious if the rubric required a certain amount of pages for the papers or was the length you wrote just what you felt was needed? 30 pages seems like quite a bit for one class. Thanks for stopping by my blog and for your comment, Marcus. The rubrics do not specify a required amount of pages for the papers. The assignments do note how many pages are “typical,” but I think that is more to give you a general idea of how much time is typically needed to complete the paper. Write concisely and you can pass writing less. First off, thank you for this great post that you put on your website. I’ve been doing a lot of research on WGU and while I love the educational model I do think that a graduate degree completed in such a short amount of time seems kind of sketchy. Would you or anyone else who’s been posting on your site be able to provide clarity as to how an MBA from there has helped you since completing it? Have hiring managers questioned the validity of your degree? Hi Rehan, this is a fair question. I work for myself, but am interested in hearing other people’s experiences on this as well. In my case, I have tried to apply some of the leadership and communication skills gained towards the non-profit organizations I am involved with. I have also helped a friend enhance her business, especially in regards to marketing and the acquisition of more customers. Some other lessons I learned that I learned from the Capstone project (e.g., using your assets to the fullest extent), I’ve applied to other areas of my life (e.g., investments). I’ve never had anyone question the validity of my degree or Western Governors University, but again, I work for myself, plus I also usually don’t mention how long it took for me to complete the program unless asked. If I am questioned, I would reply: Having taken classes at other higher education institutions, including a full engineering degree program at Stanford where I got my bachelor’s, I can assure you WGU’s classes are not “dumbed down” and I doubt they are lacking in material compared to any other university. The ability to accelerate is almost entirely because of its innovative format which eliminates the wasted time associated with going to a brick and mortar institution and the rigid one-size-fits-all schedules they impose on everyone. If others could share their experiences in the comments section of this blog too, that would be great. Thanks for your reply. I figure this is the route I would like to take for graduate study so I’m just making sure this is the right move before I make the time committment. In my area, there are over 1,000 searchable graduates currently employed so I hope that once I complete my education there that I will be one of them moving on to bigger and better things. One last question I have for you is which MBA from WGU did you complete? The BA or IT one? Also, if you could provide me a referral that would be great. Overall I’m pleased with the accomplishment and actually applied a handful of things I’ve learned towards my current IT PM role. When you factor in the cost, I am pleased with the degree and would recommend WGU to others. Hi Felix! I am about to start at WGU, and have a few questions if you don’t mind. 1)Is it true that there is a way to take exams at a secondary location like a community college? I just like zero distractions when taking a test. 2)Is there a certain page count requirement for papers? It looks as though you wrote a great deal, but I had somebody tell me before as long as all the info is in there, length is no issue. 3)Can you customize the order of course? I am thinking about getting the tough ones out of the way first, but not sure if the classes have to go sequentially or not. I don’t know if there are “official” secondary locations like community colleges you can take the exams at. But in reality, you can take the exams anywhere that is quiet with a reliable Internet connection. The way it works is you follow a course link to the ProctorU website when you are ready to take the exam, and once a proctor is available (usually within 5-15 minutes), you videoconference with him or her for a few minutes using the WGU-provided webcam. The proctor will take control of your computer to make sure you have no background applications or files open that you could use to “cheat,” and also ask you to do a 360-degree sweep of the room with your webcam. Then, while you take the exam, the proctor (I think) watches you. Sounds creepy, but it did not feel like it. There is no page count requirement. Some assignments will have a “suggested” number of pages just to give you an idea of how much time it might take to write the paper, but your paper could be shorter or longer depending on how concisely you write. In my article, I noted the number of pages I wrote just to give you an idea of how much I had to write in the program. I think you can talk with your student mentor who may let you customize the order of courses you take. Mine seemed to want (or let) me take classes in the suggested order—and that’s how I wanted to do them anyhow so I never asked otherwise—but I’ve heard of some people even taken classes simultaneously. There really is no reason the courses need to be taken in a certain sequence except for the Capstone class, which should be taken last as it uses everything you learned from the previous classes. Good luck at WGU, and feel free to drop me a line with any more questions. I am kind of late to the party, but just to let you know, you do have the option to take the exam at a testing center. I have two kids and feared they would interrupt, so I opted for the test center. It was a Sylvan tutoring center located less than 3 minutes from my house. Super friendly and easy, I scheduled the exam and had to give 3 time options. I got my first pick. It is interesting to consider the opportunity cost of education, as you discussed. WGU is definitely an interesting case. Thank you, thank you, thank you so much! I am about to dive into WGU and your in-depth experience has put my mind at ease about the curriculum and if I have what it takes to complete the MBA program. I don’t know if this degree is necessary in my career goals, but it is something that I want to achieve. I now feel confident that I can possibly complete this in at least a years time. I am kind of concerned with writing 18 page papers and possibly longer . I hope that I am able to find enough content to write my papers. Great article!! Just started M&L program and needed some pointers. Hello! I’m currently working on my undergrad in Business at WGU and expect to be finished very quickly at this pace. (I’m averaging about 12 units per month) This program is so much better for the way I function and learn and it made me realize maybe I can go farther than a Bachelor’s Degree. This post was very helpful and gave me a lot of great information to make my decision when I finish my current degree. Thank you! I start the MBA program Aug 1, and you just inspired the hell out of me. Thank you sir! Thanks for this excellent article. I just finished my BS in Accounting from WGU and am starting my Master’s in Accounting as of Sept 1. This is an inspiration! Great work Felix! AGREE ON ALL POINTS. I completed mine just last week; it took me two years though as I work full time but probably could have done it less than two years (maybe 16-18 months). There was another company sponsored MBA from my company at the same time (Redlands University) but talking with those who went for that, it did not seem like a good experience (it appears to me that the education was spoon fed). I had an awesome experience with WGU. I really felt I learned so much. Thank you. You’re an inspiration and your post helped me decide on completing my MS in Accounting at WGU! Very good article. There is only one area that needs correcting. WGU doesn’t outsource their paper grading to a 3rd party. Students do upload the submissions to TaskStream and WGU faculty retrieves the submission and provides the evaluation. Both full and part time evaluators employed by WGU perform the grading. Congrats on your degree! Thank you for the clarification on who does the grading. I will make the correction in my post. Cheers! Great article. I have been looking at WGU for awhile now and plan to begin in the coming year. I am currently a vocational navigator that helps individuals with employment and educational opportunities. I also am IT System admin for my organization, so I am all about using tech to improve life in general. That being said, I think I can add a few tech tips that may help your readers and potential students. Tech Tip #1: WGU texts are digital and therefore easily converted to different formats. Converting text to a format that will allow it to be read on a digital device in any program using “Spritz” which is a speed reading software is very easy. Almost anyone, even without speed reading skills, can use this program to read at 250 – 450 words a minute with decent comprehension and retention. I personally use “ReadMe” on IOS and can read a 30 page chapter in about 35 minutes of a 500 page book in a combined time of about 9 hours. Tech Tip #2: There are also many programs that will read text to you. Using these programs to read to you while you are driving or doing something else that prevents you from actively reading can utilize that time for study. I use “Sprint” that will read any webpage, then I upload my books, documents, or study guides to Google Drive and open them in the app. Sometimes my commute is up to an hour and I can get 1 or 2 chapters finished in that time. Tech Tip #3: Voice recognition software can also help immensely. For students, Dragon can be purchased from JourneyEd.com for $99. Alternatively, all MS Windows operating systems from Win7 forward have built in voice recognition software in control panel accessibility options. I put my Windows tablet in the passenger seat and use my bluetooth headset to “Free Write” while I am stuck in traffic in order to get my ideas down, then rearrange and edit when I can be at a computer. I also only type at about 45wpm and can get about 65wpm using voice recognition. Tech Tip #4 Quizlet. This is an app that you can use to create flashcards and study guides. The bonus is that it is linked to everyone that uses it so, more often than not, someone else has already created the flashcards or guides which saves a ton of time and makes studying for tests (or assessments) far easier. Hi Buddy. Those are wonderful productivity tips using technology; thank you! I will have to try them out with non-WGU material but it sounds like all of them could help every student as well. Best of luck in your program at WGU in the coming year! I am interested in the MSML degree at WGU. I’m curious did it pay off for you? Are you happy you got that degree over a MBA? Any input would be greatly appreciated. 1. How many questions does each pre-assessment exam have? 60 questions total? 2. How many questions does each Exam have? 60 questions total? 3. Is each pre-assessment exam timed? If yes, how many minutes? 120 mins? 4. Is each Exam timed? If yes, how many minutes? 120 mins? 5. Can pre-assessment exam be taken multiple times until students feel comfortable to proceed with the Exam? 6. I understand that the Exam can be taken multiple times. If after taking the Exam for 2 hours but fail, can students re-take the Exam immediately after receiving the fail result or should the Exam be taken some other time? 7. Are any cheatsheets allowed during Exam? 8. Based on your experience, are Exam questions based on the materials provided? I mean as long as students read/study all the materials provided, they should be able to answer the Exam questions, correct? 9. For Capstone, is the company students need to research assigned by WGU or can students choose it with mentor’s approval? 10. For presentation (C204 + C216), do we have to record it first and submit the video or is done live online? 11. How many questions does each quiz have for C216? 12. Is each quiz timed? If yes, how many minutes? 1. The pre-assessment exams have the same number of questions as their corresponding “real” exams. 2. The “real” exams generally have 50-70 questions, but most frequently 70. 3. Each pre-assessment exam is timed and has the same time limit as their corresponding “real” exams. 4. Each exam is timed and generally are two hours, although I think one was three? The vast majority of the time I did not need the full time limit. 5. Once you pass the pre-assessment the normal protocol is to proceed to the exam (after you have reviewed course topics that the pre-assessment revealed you to be shaky on). I am unsure if you can take the pre-assessment again once you pass it; if so, I think it would be your student mentor who gives you such privilege. You can take the pre-assessment as many times as you need to until you pass. 6. If you fail the “real” exam, you can take it again after a two-week period for free. After the second failure, each re-try will cost something like $60 (I believe this is to encourage you to be serious when taking the pre-assessment and is not a money grab). 7. No cheatsheets of your making are allowed during the exam. However, there are a couple exams (e.g., the Finance one) where a “cheatsheet” is provided in the exam that contains formulas and the like. The only items you are allowed to use other than your computer are a WGU-provided 8.5×11″ whiteboard and a WGU-approved calculator. Right before the exam the proctor will take control of your computer to make sure no other applications are open. He or she will also have you show your room/desk space to ensure you have no disallowed materials out. 8. Yes, based on my own experience, 100% of the exam questions are based on the textbook materials. Sometimes I would not know the answer to a question and think “I don’t remember reading that at all!” but upon review of the textbook material, the answer to the question would always be in there, often to my surprise. Also, in my experience, the exams do not ask anything within the optional materials (although sometimes the optional materials are useful for your papers). 9. You choose the local company for the Capstone writing assignment and then get it approved by your course mentor. 10. You record the presentations and then submit them; they are not done live. So you can do as many “takes” as you need to get your presentation just right. Video editing (e.g., cutting and splicing) is also allowed. 11. There are six quizzes for the C216 pre-work containing 10 question each. Passing score is 70% for each. You can take them as many times as you need to and immediately; they do not require a proctor and are more informal than the exams. 12. I don’t think the quizzes are timed. They don’t really count for much except that in the case for C216, you are required to do (and pass) them to move on. Hi Felix, I read your post initially when researching WGU and I think it was the deciding factor for me choosing their online program, so I wanted to say thanks for that! I was rereading your post and my timeline was almost exactly the same as yours. 3 months of classes and 6 weeks on the Capstone. I definitely worked very hard, but I still worked my day job 40+ hours per week and still feel like I had a life. If you are motivated this is a fantastic opportunity to get an accelerated MBA. Hi Felix, I reached out to you last year to seek feedback on the program. Thanks so much for the information you provided. I officially finished the program yesterday in exactly 4 months. Thanks again! Hi Felix! Thank you soooo much for the information! I went to WGU a few years ago and ending up slacking off. Now i’m restarting my bachelor’s program in January 2017 and this has been so inspiring. Do you happen to know of anyone that completed the bachelor’s with the same acceleration as you did with your MBA?? Hi Danielle. I haven’t heard of anyone completing a WGU bachelor’s with similar acceleration, although I am sure there has to be some students who have. If anyone reading this has done so, please leave a comment here! I just started my MBA officially 1st of January. I was able to take 2 classes within my bachelor from WGU so I just finished my 3rd class and I’m only officially one week in the semester. I need (really want!) to finish my MBA within 1 semester. So thank you so much for all the tips and help!! Saving your blog to go back to it for references. I love WGU. With two jobs now I really hope I will have enough time to finish by end of June. Might look at the speed reading classes online. Thank you!! And congrats!! So proud of you ! Thank you for sharing your success story. You have inspired so many people, not just students. I completed my under-grad studies at WGU as well and I am currently enrolled in the MBA program at WGU. I received my AAST Accounting degree at a brick and mortar and my BS in Business Management at WGU. I have enjoyed the experience and look forward to the challenges that lie before me. I just completed my first term a month early (no where near your pace), but am happy with my results. I do have one questions that I would like to ask. I find that my progress is stimulated by visual aids and or resources. For that reason, I find cohorts beneficial. Do you have any suggestions moving forward that I may utilize in this regard? I look forward to competing my degree and possibly pursuing additional programs at WGU that could provide me with opportunity for growth and maturation personally as well as professionally. Thank you for your time and your story. I look forward to hearing from you. Hi Robert. Congrats on both your accounting and business management degrees and for starting the MBA program. Thank you for your kind words as well. Regarding cohorts, that was one resource I did not utilize significantly. I recall listening to one or two live presentations, but decided they were not the most effective use of the time. I understand learning styles differ, however, and they may be beneficial to you. What I would suggest is try participating in one or two of the cohorts for your first classes and if they are helpful, keep at it. I have yet not delved into additional programs or opportunities at WGU to help me professionally, unfortunately. If you get involved with any, I would be interested as well. Best of luck with the MBA and happy new year! Felix, what an inspiration. I will be trying to complete this Masters at a much slower pace. 3 kids under the age of 4 and a part time job. Thought I couldn’t do it but figure if people are doing it in just one semester… I could do it in three. I have you bookmarked as one of my favorites so I can constantly go back when I need a push. Congrats! And thank you for sharing your experience! Hi Felix, I recently completed my MBA just shy of six months total. Thank you so much for this article, it served as consistent motivation. When I was first investigating wgu as a possibility, I never would have imagined I would have been able to complete it in such a short of time. Thank you. Hi Mike. Thanks for your note and congratulations on finishing your MBA in under six months! That is a great accomplishment. I hope you had some time to celebrate. Best of luck in your future endeavors. Thanks for stopping by my blog. Excellent review! Thanks a bunch. Since I’m considering (and actually have applied to) WGU, I found this article very helpful. Once again, thanks for writing this. Congratulations on applying to WGU and thanks for the comment and the correction! I have changed it now. Best of luck and let us know how your experience at WGU goes! This was so helpful! I will be starting my MBA through WGU in the next couple weeks! Hello I will be starting my MBA on May 1st. That was really helpful. Thank you ! I just finished the MBA orientation at WGU and stumbled upon your blog. Very inspirational and on point. Will do my best to catch up with your style and drive, as officially starting the program on May 1. Thanks much Felix. I just wanted to say thank you for writing so thoroughly about your experience. With such a unique approach to higher education, I found myself interested but skeptical of WGU. I’m grateful that I stumbled upon your post. Very refreshing and inspiring. WGU is a hidden gem that could benefit many seekers of higher learning. They don’t typically admit international students, but fingers crossed that they’ll admit me, as I’m living in Afghanistan for 2+ more years. Thanks again for you post, Felix! I came across your article while looking for more information on WGU. I’ve already filled out the application and had my transcripts sent over but am feeling hesitant. Not really sure if the time and money spent would benefit me at this point in my career. I’m 58 years old but am feeling pretty stagnant in my job. Your point of view has helped to shed more light on the WGU experience. Good job in taking the first steps, Pete. Even if you have your doubts, I think you may find the experience personally rewarding, even if you are not immediately rewarded for it at your job. If the latter doesn’t happen, it may open doors for new opportunities as well. The cost is low enough to be a low risk endeavor, and even with all your job experience I am sure there are many things you will learn from the program. Best of luck! I’d be interested in hearing about what you think of the program and experience after you are done. Thank you for posting this. I begin the MBA program at WGU next month. I hope to complete it in one year, but after reading your message above, I am confident I can do this in less than six months. I earned the B.S. in Business Management through WGU start to finish in less than three, six month terms applying many of the same techniques you wrote about. I will apply the others you mentioned that I had yet to think about and see how much faster I can go! Again, thank you for posting this. It is quite inspiring. Hi Christina. Thanks for stopping by my website and for dropping me a line. I especially appreciated your note because you had done a B.S. through WGU. Many people asked me how quickly it would be possible to accelerate through a WGU’s bachelor’s degree, and I had to reply I had no idea because I never did one over there nor knew anyone who did. That is fantastic you were able to finish in under a year a half! Congrats! How exciting you are beginning the MBA program in a couple weeks. Especially since you have a B.S. in Business Management, I am sure you will breeze through the MBA program in a semester. Best of luck! My undergraduate degree in Finance/Accounting was attained about 20+ years ago and since then I have assumed financial management positions with local government agencies. What would you consider are challenges a non native speaker / English learner will face with the online learning at WGU? Thank you so much for your post. I am inspired! Hi Ginger. Thanks for stopping by my website and for your comments. For a non-native speaker, I would imagine it would take a bit longer to read the textbooks and write the papers than for native speakers. That is the main challenge. But your English looks perfect so I do not think you are going to have many problems. ? Besides, nothing in the rubrics says to take off points for bad grammar, so as long as your English is good enough to get your points across in a logical and clear manner, don’t worry if your English is not as good as a native’s. For non-native speakers, I would think that online courses are MUCH better than traditional brick and mortar schools where attending lectures is emphasized, since it is easier to understand written text than oral text. At least, that’s the case for me with my second and third languages of Spanish and French. I just started my second semester and I have Marketing as my first course. This should be a pretty easy subject. Thank you for posting this. PS You should add your picture on your site. I have bookmarked this article. I stared my MBA at WGU, and even though I am certain I cant finish in 4.5 months, my goal is to use your post as inspiration to finish in 12 months. You have inspired me! Hi Mark. You did the MBA in great time. Major congrats! Hope you had time to celebrate! Thanks for the note and enjoy the rest of the summer. Best of luck in all your future endeavors! Hi Felix, Your story has inspired me a lot. I have bookmarked your post and come back and read it again when I loose motivation. I had planned to finish MBA@WGU within 1 year, but i think I’m falling behind. My one year finishes by Feb and I still have 4 courses to go. 🙁 I’m doing a retake on Finance management currently. I missed it by one or two questions in the first attempt, I was so close. Are the questions different on multiple attempts? Do you have any idea? I finished all the previous ones in first attempt. I have started to loose hope a little. I’m a single mom with a full time job and this is really getting tough. Any tips is appreciated! KayKay, I just finished my Financial Management class last night. It was the first exam I was actually celebrating after passing, as it wasn’t an easy one. I watched the videos multiple times, and got very familiar with that Financial calculator. Practice, practice and practice. Watch the videos also, especially Dr V’s video. From what I have heard, the questions do differ on every attempt, as there are multiple exam sets. Good luck!! You can take more than one class at a time. I am taking 3-4 at one time. Extremely helpful info particularly the closing section 🙂 I handle such info much. Hey buddy, awesome write up you have here. People like you are the ones who drive this world forward and I aspire to be more like that. Would you say that papers are graded strictly? Should I ignore the more in dept guidelines for papers? I was going to start my MBA-HM at WGU, but I’m now having second thoughts after seeing c200 task 1. I completed the paper but cannot submit it until I start officially and my first payment is taken. I followed the rubric, but still doubt myself and my ability to actually do this… I don’t want to pull out before starting, but I also can’t deal with the stress of needing to redo work when I am already cutting out time from my busy life to attempt this. As my mentor explained, I can just skip right to the assessments and look back on the information needed to answer each part. However, how true is this? I can manage that with my busy schedule, but do you think it will result in me having No Passes? I thank you so much for your time in helping me get my head straight with all of this. I already have two bachelors and my MSW/LMSW… I just really wanted to top it all off with this degree. Any insight would be greatly appreciated. Hi Ant, thanks for stopping by my blog and for your comment. I would say papers are not graded too strictly; the graders are very reasonable. As long as you follow the rubric and can back up your points, you shouldn’t have a problem. I’ve never had a paper returned through the MBA program, nor through the MSML program I am now on the last class on. That is not to say the papers are “easy;” the C200 ones are pretty representative. Another tip is to look at Task Tips (and q&a’s in the Chatter sections of each class) if you are having trouble. You can do this! Best of luck! I am thinking of doing the Master of Science (Management and Leadership). Has anyone done this one or have what it entails as to work? I was advised on the MBA that it has a lot of math and graphs so this route may be better. Hi Trina, I am currently doing the MSML (3 years after doing the MBA) program as “continuing education” for myself and am nearly done. I am in the final Capstone class right now and should be done within the next month. I’m not going at nearly the same accelerated pace as the MBA since I am working full-time, but I already fulfilled five of the MSML classes by doing the MBA and did not have to repeat them. So the MSML for me essentially meant just doing six classes. I would say the MSML is more appropriate for non-profit organizations, clubs and smaller companies. The MBA, which may be perceived as more prestigious, would be more appropriate for larger companies and multi-national corporations. I know of one other person who has done both the MBA and MSML and I’d bet he’d say the same thing. Whichever one you do, you’d find it worthwhile, I think. Doing the MSML this year reminded me of all the things I love about WGU and I am still extremely satisfied with the university. Are you able to list the courses and course work like you did for the MBA? I will be writing an article in a few months time about it after I finish the MSML and life gets a little less crazy with everything else going on. Promise! First of all, great article! I discovered WGU through you and I will be starting my MBA in July. I am looking forward to read the new post on MSML. Best of luck on your MBA, Shar! I hope to write a post on the MSML sometime in July. I finished it a few weeks ago and am now catching up on other things, but am glad to have done it. Great review. I finished my Bachelor of Science (IT — Software Development) with WGU, and I’ve been itching to get going with graduate studies. In my situation, their MBA with a focus on IT management is more up my alley. The most surprising thing about my WGU experience was on-the-job performance. I was shocked at how easy it was to go into server rooms of large multi-national corporations on contract and actually know more about what’s going on than the people that worked there. Just wanted to say that I stumbled upon this post in February of 2018, enrolled in the Bachelors of Science in Management degree program as of March 1. I have struggled for 25 years searching for the program that fit me. I was able to transfer in over 80 credit hours from the four different colleges that I have taken classes at. I completed the remaining 40 credit hours on May 2, 2018 – 2 months and 2 days. Your blog inspired me, and I printed this post and referenced it constantly as my motivation to study every minute of time I had. I wanted to let you know that your blog inspired and motivated me to achieve this life-long dream of earning a degree. I plan to enroll in the MBA program and become the first person in my family to earn an advanced degree. This program was not easy, but I was immediately able to apply what I learned to my current job. I just wanted to say Thanks for posting this and helping me with this life achievement. Great success story, Mike! Thanks for your comment. Congratulations on completing your bachelor’s degree and best of luck in your endeavors, including a future MBA! What a great write up , Felix! I’m going to be starting an MBA here soon and want to follow your path somewhat. Thanks for sharing! Question: My last college math/ stats classes were some 25 years ago, so I’m a little rusty. Actually I’m probably very rusty. Did the Finance and Data classes involve alot of complicated math and the instruction fill in the gaps. This is one area in the whole program I kind of dread having to face . Hi Shane, thanks for stopping by my site and for your comment. None of the math exceeds Algebra 1 level, and the most math-intensive class allows use of a financial calculator (e.g., TI BAII+). Since you took a statistics class before, it will come back to you. It was about 20 years since I had taken a stats class too. Best of luck! Let me know how it goes! Thank you so much for this blog. I am starting on July 1st, and I have been out of school for 19 years. You have eased my mind. Thanks for your comment and best of luck, LEB! Thank you; you have inspired me. How did you decided to divide up your days? I want to do something similar for the MSML I am getting ready to start. To help keep me on track, but how will I know what needs more time etc..
Hi Lesley. There are pacing guides for each class, saying what you should study each week if you were doing the class in, say, 6-8 weeks. So you can scale accordingly. I finished the MSML a few weeks ago and the same principles from my original article apply. Sometime in the next couple months, I hope to write a blog post about the MSML. Best of luck with the program! Thank you. Yes I would love to know how many days the other classes in the MSML program took you as well as how many papers and quizzes as a guide for myself. I wanted to take a moment and say thanks for posting your experience with WGU’s MBA program. It served as an inspiration for me in the beginning of my journey towards WGU’s MBA in IT Management. This post was one of the first articles I “stumbled” on when I was looking to gain some insight into how to manage my expectations once I started a year ago. I found your information spot on as I moved through the program. It helped tremendously to have these insights into this process. I didn’t complete the degree in 4.5 months since I was working, but I am about to start the capstone and on track to graduate one year early. To reinforce the point you made about working with a mentor: In my experience, I found having a good mentor was extremely useful as well, and trusting the advise he gave helped me hurdle some issues along the way or to gain clarity in the process. So the one thing I would share from my experience is to trust the mentor and use them to your advantage. They are there to help you succeed. Thank you to Bradley Hall! Hi Thomas. Great job on your MBA. You are nearly done! Agreed about the mentor. Good luck finishing up the program and congrats so far. Thank you for posting about your experience. Your post has pushed me to really think about going for my MBA at the same school and to shoot for the starts like you did. I have one question for you. Is it true that the University sends a camera to watch you when taking the exams? There are two things that scare. 1. I have a fear of cameras or being seen. I put tape on my laptops camera out of fear. 2. Is the oral presentation. Who did you give the oral presentation to? Was it just a recording sent to someone that never responds? Hi Jory. Yep, it is true that WGU sends you a (very low quality and low resolution) webcam so that you can be watched by a proctor while you take exams. It may sound creepy but it is not as bad as it sounds. I actually found the proctors encouraging. For your oral presentations, you need to record them using any video camera you have (even a cell phone is fine). The great thing is that you do not have to do the recordings in front of a live audience and can do a lot of video editing. In fact, I’d recommend that for the long oral presentations (such as for your Capstone) so that you do not have to do a 15-minute presentation with over a dozen sections in one go. Just do a couple minutes at a time, doing re-takes as needed and splice the clips all together. The recordings are graded just like the other assessment. The grader’s response is either a “competent” or “needs improvement” along with a paragraph summarizing the result. I’m a CPA looking to add the MBA to diversify my skill set and boost my resume. How many hours per week, at minimum, could the average student commit to simply pass this program in six months? My local MBA university wants me to work through 40 hours of “pre-course math” before I can take a single class in their purportedly affordable MBA program (55k University of Washington – two year minimum completion). Thanks for your detailed post. It’s an outstanding outline of what to expect. Hi Blake. To complete WGU’s MBA in six months, I would speculate a very efficient student could do so committing a minimum of 20-25 hours/week. I say that based on my own personal experience: if memory serves me right, I think I was probably averaging 40 hours/week, and I finished in 4.5 months. I could have been less thorough and still been passing assessments, however, and while I am a pretty quick learner I am sure there are even faster learners and speed-readers out there. If you only had 10 hours/week due to having a family and full-time job, I think it would take at least a year. Thanks for stopping by my website and for your question. I hope this helps! Thank you, Felix. I appreciate your very timely feedback. I did the same exact thing with WGU before I started medical school. Such a great value. Awesome post. I will get started!